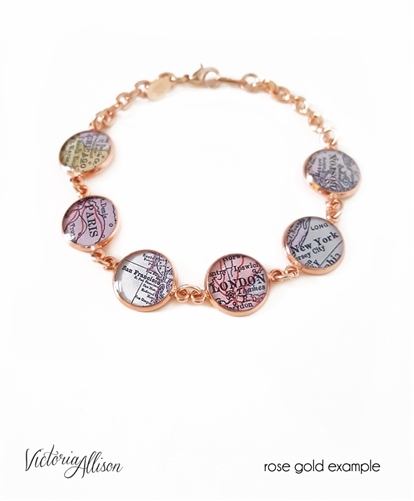 These pretty bracelet features the city or cities of your choice, set in rose gold plated bezel charm links! You may choose up to six cities for your bracelet. Each map charm measures a little over 1/2-inch/1.3cm wide (not including the connector loops.) 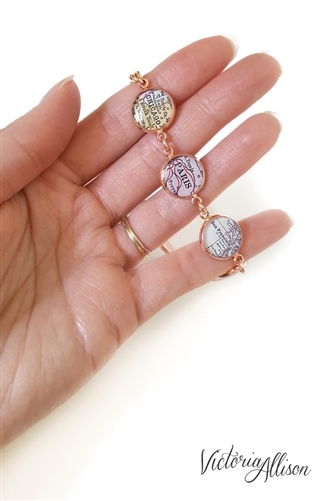 The map inside the charm is protected with glossy jeweler's resin for a water resistant finish, but as with all jewelry, please take care to keep it dry to preserve the finish and longevity of the bracelet. Please write in your city choice(s) in the "City Featured" box. If ordering more than 1 charm on your bracelet, the charms will be arranged from Left to Right in the order that you list them. ***PLEASE NOTE*** that these maps are printed from my own antique atlas collection. The atlases are nearly 100 years old and sadly do not include *all* cities and towns, so some small towns may not be available. You may write in a 2nd choice/alternative if you are unsure whether I'll have the first one. All major cities are available. Unfortunately I cannot offer street addresses or landmarks. 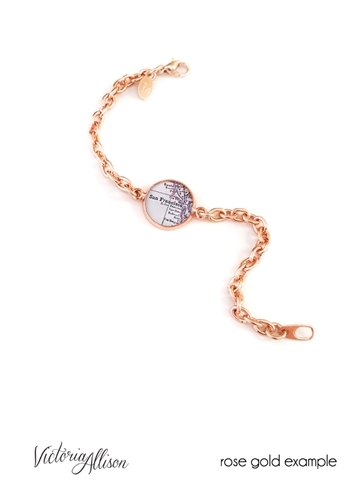 This design features rose gold plated chain, in your choice of bracelet length, from 5 1/2-inches/14cm up to 8-inches/20.5cm, finishing with a lobster clasp closure. I recommend measuring your wrist (remember to add an extra inch to the length for a comfortable fit,) or measuring the length of a bracelet you already wear. Average/medium wrist would typically wear a 7-inch length. If your bracelet has multiple links, I recommend adding a little extra length as well.